My poison ivy is much better! Thanks to you all for your kind wishes, prayers, and advice. I still have some crazy looking spots on my arms but they don’t bother me anymore. Poison ivy and I are keeping a uneasy truce at this point. Last Saturday, as we were leaving to meet Yiayia for dinner, we discovered that we had some very special visitors on our butterfly weed plants (which is a species of milkweed). We have a bed of native flowers, including lots of butterfly weed, that runs the length of our driveway. We were a bit late to meet Yiayia because we were having so much fun watching our visitors! We ended up finding at least eight monarch caterpillars, in varying sizes from quite tiny to quite large. We were so excited to see them as they are such strikingly beautiful caterpillars. We especially loved watching this one eat a piece of a blossom. Now, six days later, I can’t find any sign of them or their chrysalises. All I can find is their frass, which is what I’ve just learned is the official name for their poop. So I’m not sure what happened to them, other than that they got eaten by birds. We were looking forward to possibly seeing some butterflies emerge. Sadly, I don’t know that we’ll be able to see that happen this year. 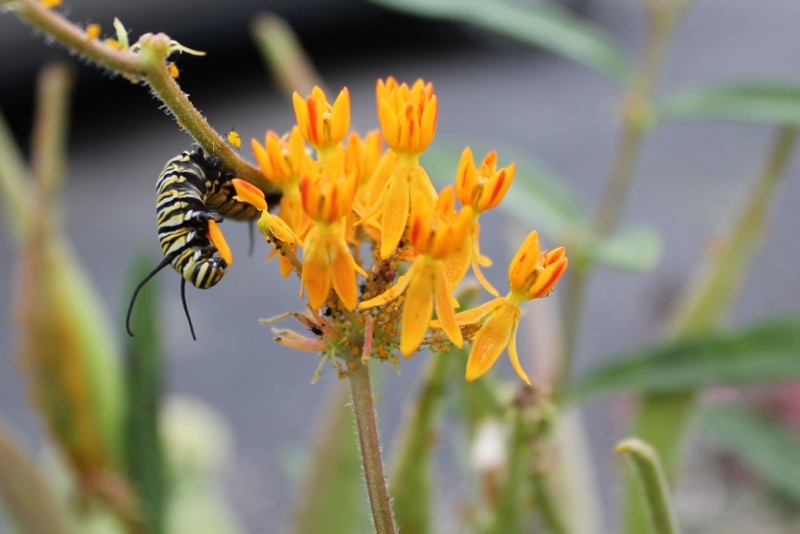 Still, we were glad to know that the monarchs found our butterfly weed to lay their eggs on! (We did see at least one monarch flying around a couple weeks ago so I guess that explains where the caterpillars came from.) Come visit anytime you’d like! P.S. So for any of you monarch experts out there, I thought that the life cycle was such that the butterflies lay eggs every so often, the new ones emerge, keep flying north and then the final generation flies all the way back to Mexico to overwinter before starting over again. It doesn’t make sense to me that the caterpillars would have time to turn into butterflies and then get all the way to Canada (with a few generations more in between) before flying south in October. I can’t seem to find any information about this online though. Can anyone enlighten me: Is it weird that we found these caterpillars in very late August in central Maryland? What fun! I love watching the butterflies. Here’s a link to the Monarchs I grew up visiting. It gives a brief description of the migration patterns for the Monarch population west of the Rockies (obviously not MD’s butterflies, but I thought it was still interesting). Thanks Karyn! I’m inspired to plant all kinds of butterfly habitat now! Way cool! What a shame they’re gone. Keep looking, maybe they are just really well camouflaged as a chrysalis. Nothing eats a monarch, right, that’s why they eat milkweed? According to what I read (http://www.monarch-butterfly.com/), you witnessed the last generation, which will turn itself into a butterfly and fly to Mexico, and live for 8 months before returning north to start it all over again. We found black swallowtail caterpillars last September and turned most of them into butterflies. I won’t overwinter again; they popped out too soon in March, a nasty March for butterflies. Anyhow, thanks for sharing. Finding monarch caterpillars to share with my kids is a dream; I’ll have to get some of that local milkweed you mentioned. I’ll definitely keep searching for them. And I’d forgotten about their inedible nature! Thanks for figuring that out for me. I guess I thought that all monarchs had to go far north but evidently not. Also, I have TONS of that butterfly weed. I had to move it around this spring and the plants that I moved survived, plus all the roots that I didn’t get out grew more plants. So I’m going to need to get rid of some of it this fall. If you’re ever back in Baltimore, I’d be happy to dig some of it up for you. So cool! Hopefully you will get to see the butterflies too!! Maybe this spring I can stop by and grap up some of that plant. Or get Betsy to be go between. We’re in Sykesville now until we save money for the new place, I can plant butterfly weed at my father-in-laws, and then dig some up and take it with when we go, wherever.